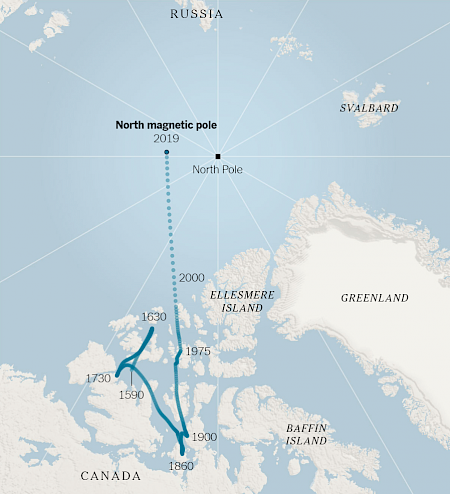 The magnetic north pole has traveled 1,500 miles since 1860, but the wandering is not the issue; what’s surprising is the increased rate at which it is moving, from an average of 6 miles per year in the 20th century to 30 miles per year these days, making its location more difficult to predict. It appears the earth’s molten iron core is getting restless. There have been five mass extinction events since life on Earth first began in the Cambrian period over 540 million years ago. The latest one, evidenced by the K–Pg (Cretaceous–Paleogene) boundary, marked the end of the Mesozoic era and the beginning of the Cenozoic ~66 million years ago, (Fig. 1). Earth’s biodiversity has increased steadily ever since, although the rate has slowed down in recent history due in part to the growing influence of homo sapiens, to the point that some scientists are talking about the sixth mass extinction. In contrast, the junior mining sector, which has been feeling the pinch of declining mining-related investment since the TSX and TSX Venture (TSXV)’s peak of 2009, may actually benefit from an extinction event on its “biodiversity” pool. There are more than a thousand junior mining companies currently listed on the two Canadian stock exchanges, far eclipsing any other industry, (Fig. 2), and simply put, the money to sustain them is not there any longer. 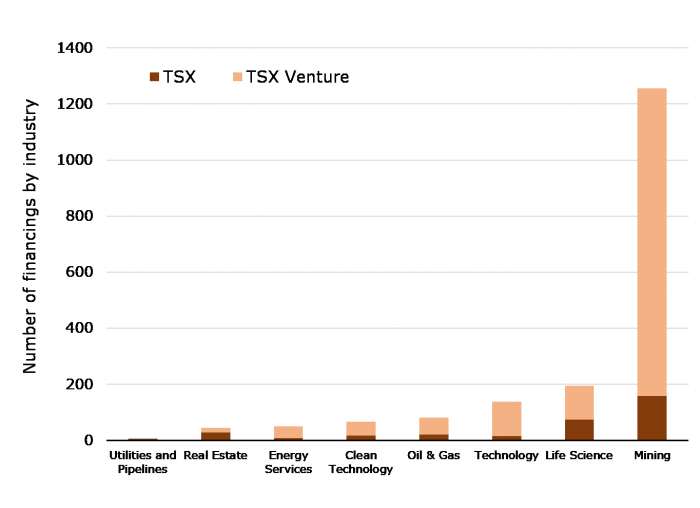 The TSXV, in particular, attracts the majority of “would-be” junior mining entrepreneurs and hosts junior mining companies with an average market capitalization of C$15 to C$20 million. 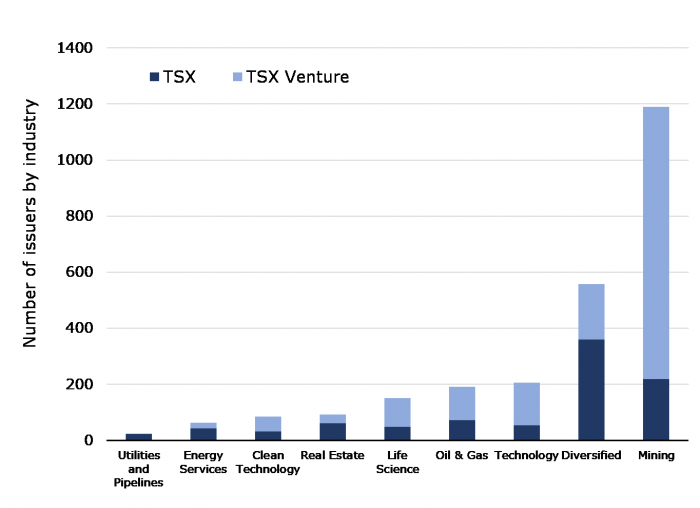 Out of the 55 initial public offerings (IPOs) by mining-related companies on the Toronto exchanges during 2018, the majority (45) were on the Venture. 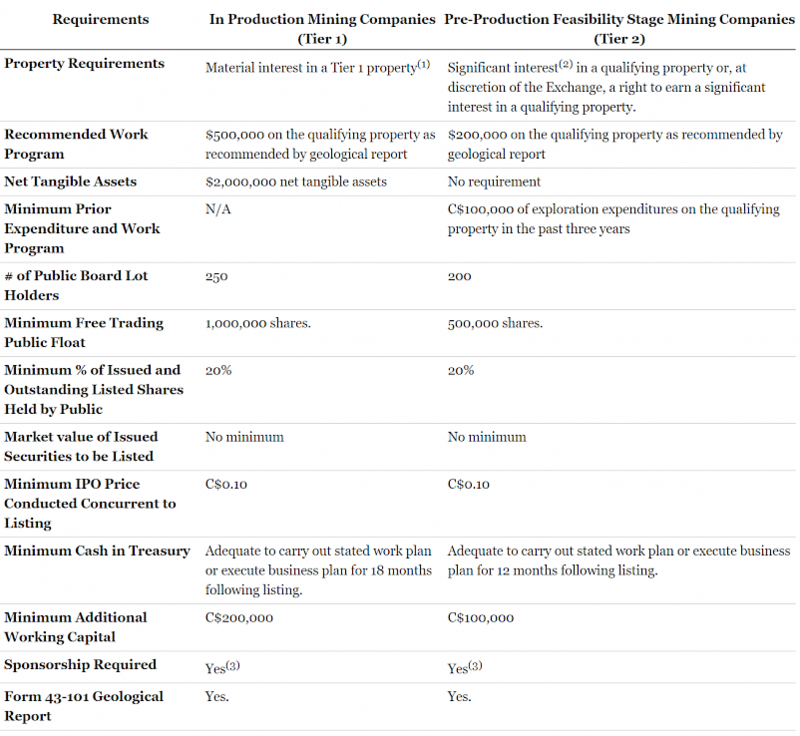 The listing requirements for a junior mining company that is not in production are not particularly egregious, (Table 1). Concerning funding, the company only needs a C$200,000 work program over the ensuing 12 months or so and C$100,000 in unallocated funds. However, being listed on the TSXV is just the beginning for a non-cash flowing junior mining company, and is no guarantee of its survival. The ability to serially tap the equity market ecosystem for money to support another year of life is a crucial skill set. The problem is that any ecosystem, including the equity markets, has limited resources available for its inhabitants, and the mining sector has been disproportionately turning to equity financings as a source of funding, compared to other industries. 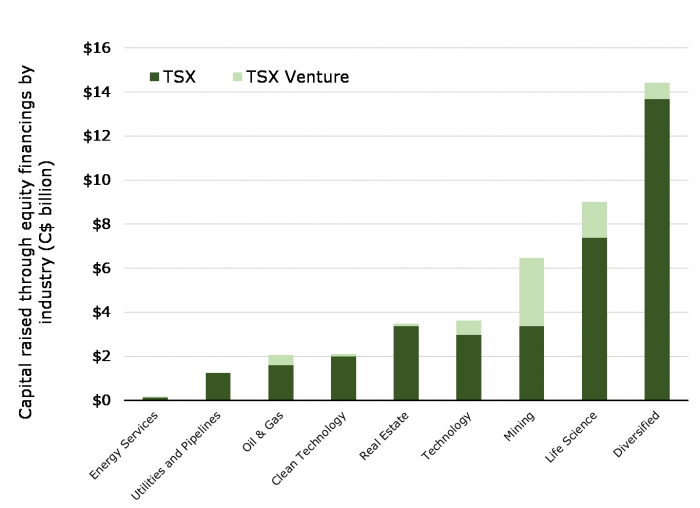 In 2018, 65-70% of all financings (>1,200) emanated from this sector with the vast majority (85-90%) sourced from juniors listed on the TSXV, (Fig. 3). Despite the excessive number of financings, miners don’t get the majority of proceeds, (Fig. 4). Through only 200 financings, the Life Science sector, which includes cannabis companies, raised more total proceeds (C$9 B > C$6 B) and money per transaction than the major (C$100 M > C$20 M) and junior (C$13 M > C$3 M) miners. An ecosystem can change over time. 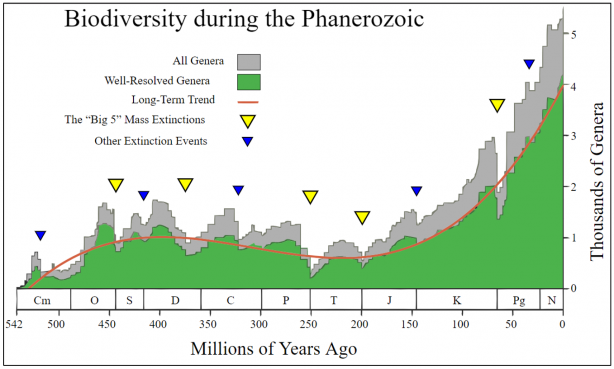 Some attribute the changes in climate that brought about the K–Pg extinction event to an asteroid impact, a gigantic volcanic eruption, or both. In the mining sector, the decline in equity financings can be in part ascribed to a change in attitude by generalist investors. In the chart below, (Fig. 5), Macquarie analysts have recorded the number and total proceeds from significant mining equity financings (>C$10 M) over the past decade. 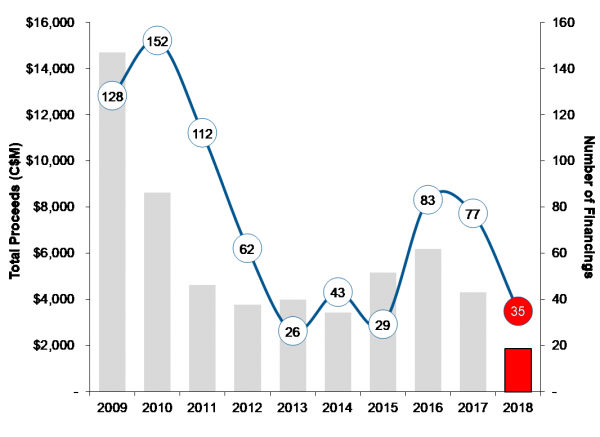 Total proceeds peaked in 2009 at over C$14 billion (128 transactions), averaging well over C$100 million per transaction, followed by a protracted trough between 2013 and 2015 before rising to ~C$6 billion (83 transaction, >C$70 M average) in 2016. Last year saw the lowest amount of money raised (C$2 billion, 35 transactions, <C$60 M average) over the decade. Such marked reduction in the amount of money available for the mining sector reflects in part the fact that, at least in the precious metal sector, most of the investments are being directed to passive funds (ETFs), while active funds are facing redemptions that are reducing their assets under management. As companies fight for relevance and survival in this new reality, we saw a wave of mergers rise in 2018 and spill into the new year with the mega-merger last month between Newmont and Goldcorp (link here). The consolidation trend has also impacted major investors. Several days ago, Tocqueville Asset Management and Sprott entered into a joint venture to co-manage a new precious metals investment fund (link here). In summary, the dwindling resources of the equity market ecosystem may be insufficient to fund every capital-intensive operator and cash-starved junior, hence the trend towards more consolidation at all levels, including both companies and investors. 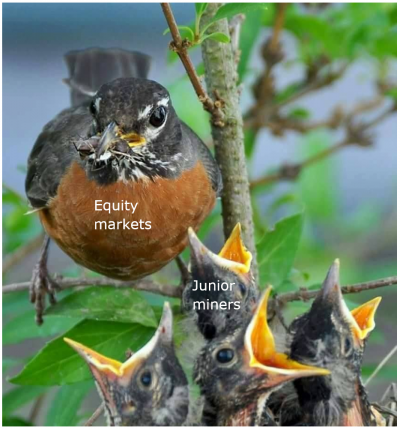 Like the birds that outlasted the dinosaurs after the K–Pg extinction, the small market capitalization, non-cash flowing junior mining companies will need to adapt if they want to continue tapping the limited resources of the ecosystem they inhabit. In the end, not all will survive, which is not necessarily a bad thing. Among those that we believe have a higher chance of staying relevant are the prospect and royalty generators. Their strategy is to reduce their financing risk by using their partner’s capital to fund exploration on a diversified portfolio of assets in the search for a potential discovery. However, the prospect generator model in itself is no guarantee of success; it should be managed by competent technical and finance teams that know how to deal with the capital markets. For research on our favourite micro-cap mineral exploration and development companies, get Exploration Insights, our premium weekly newsletter and resource for sophisticated investors and mining executives. By subscribing to Exploration Insights, investors receive a rigorous, factual analysis of mining projects and companies based on more than six decades of combined industry-related experience (corporate, field, buy and sell side) in over 60 countries and supplemented by thorough on-site field evaluations. When speculating in this highly risky sector, there is no substitute for the expertise derived from years spent in the field and doing valuations to truly understand both the potential for a mineral discovery and the fatal flaws that make an economic project all but impossible. To learn more, click here. This letter/article is not intended to meet your specific individual investment needs, and it is not tailored to your personal financial situation. Nothing contained herein constitutes, is intended, or deemed to be--either implied or otherwise--investment advice. This letter/article reflects the personal views and opinions of Brent Cook and Joe Mazumdar, and that is all it purports to be. While the information herein is believed to be accurate and reliable, it is not guaranteed or implied to be so. The information herein may not be complete or correct; it is provided in good faith but without any legal responsibility or obligation to provide future updates. Research that was commissioned and paid for by private, institutional clients is deemed to be outside the scope of the newsletter, and certain companies that may be discussed in the newsletter could have been the subject of such private research projects done on behalf of private institutional clients. Neither Brent Cook, nor Joe Mazumdar, nor anyone else, accepts any responsibility, or assumes any liability, whatsoever, for any direct, indirect or consequential loss arising from the use of the information in this letter/article. The information contained herein is subject to change without notice, may become outdated, and may not be updated. The opinions are both time and market sensitive. Brent Cook, Joe Mazumdar, and the entities that they control, family, friends, employees, associates, and others, may have positions in securities mentioned, or discussed, in this letter/article. While every attempt is made to avoid conflicts of interest, such conflicts do arise from time to time. Whenever a conflict of interest arises, every attempt is made to resolve such conflict in the best possible interest of all parties, but you should not assume that your interest would be placed ahead of anyone else's interest in the event of a conflict of interest. No part of this letter/article may be reproduced, copied, emailed, faxed, or distributed (in any form) without the express written permission of Brent Cook or Joe Mazumdar. Everything contained herein is subject to international copyright protection.